The Wayne State University Mike Ilitch School of Business has announced the 2017 recipient of its signature Distinguished Alumni Award. 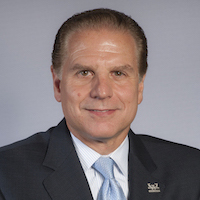 David Leone, who earned his MBA from Wayne State in 1985, will be honored at the school’s 37th Annual Recognition and Awards Program on Thursday, Aug. 24, at the Detroit Marriott at the Renaissance Center. Leone is Executive Chief Engineer, Launch Excellence, at General Motors. In this role, he leads a cross-functional effort across the GM enterprise to assess and drive improvements to the way the company brings new vehicles to market. Previously, Leone served as Executive Chief Engineer for Cadillac and Global Performance Luxury Cars, a position created to drive brand focus through product content, design, engineering and commercialization. He was the leading force behind such vehicles as the award-winning Cadillac ATS, the 2013 North American Car of the Year; the 2014 Cadillac CTS, which was named MotorTrend’s Car of the Year and placed on Car and Driver’s 10 Best Cars and Road & Track Best of Everything; as well as the 2016 Chevrolet Camaro, named MotorTrend Car of the Year. Prior to this appointment, Leone was the Global Vehicle Line Executive and Global Vehicle Chief Engineer, RWD and Performance Vehicles. In this position, he received numerous awards for the 2008 CTS, including MotorTrend’s Car of the Year, Car and Driver’s 10 Best Cars and a Consumer Reports Recommended Buy. He also held the position of Vehicle Chief Engineer for the XLR, Director of Interiors and Program Director. Leone earned his bachelor of science in mechanical engineering at Oakland University. He serves on the Mike Ilitch School of Business Board of Visitors and has been a member of the Society of Automotive Engineers for years. For the second year in a row, the Annual Recognition and Awards Program will be emceed by Fox 2 Detroit anchor and reporter Roop Raj. In addition to Leone, the event will also honor student scholarship recipients, Emerging Leader Award winner Fares Ksebati, and the yet-to-be-announced winners of the Michigan Executive of the Year Award and Inspirational Teacher Award. Sponsorship opportunities for this event are now available. If you are interested in becoming a sponsor, please contact Steve Townsend at smtownsend@wayne.edu or 313-577-0202.